Want to see Staten Island sold to Jersey? A new nuclear power plant in Williamsburg? A “Final Solution” to the hipster infestation? 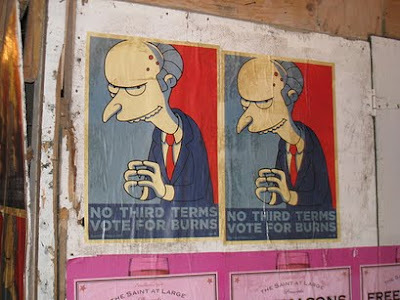 Then vote Burns! Maybe you’ve seen the signs popping up around stalled construction projects locally, but if not, just know that there’s a new really rich white guy in town (how many does that make now?) and he’s gunning for Mayor Bloomberg’s job. Actually, the satirical candidacy of Montgomery Burns is a direct attack on Bloomberg. It may sound like a farce, but it’s aimed at upending Bloomberg’s push for a third term through sheer grass-roots force. Keeping the tourists away from the rest of us? Excellent.